A branch of Todaiji Temple. 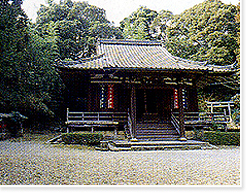 This temple greatly flourished during the middle ages in Japan, but was damaged by war. The current main hall was rebuilt in 1663. Kotsu bus bound for Hoji and get off at Takayama Gakkomae stop. from 6 a.m. to 6 p.m.
from 5 a.m. to 5 p.m.